Dubai, UAE, May 15, 2018: Saint-Gobain presented the awards for the international final of its 14th MultiComfort House Students Contest following the competition held in Dubai (United Arab Emirates) chaired by Pierre-André de Chalendar, Chairman and Chief Executive Officer of the Saint-Gobain group, and Mr. Dawood AbdulRahman Al Hajiri, Director General of Dubai Municipality. “Again this year, this 2018 MultiComfort Students Contest will be noted in the records for the high-level quality of the projects submitted by the students. I am always amazed by their innovative spirit to use the Saint-Gobain Multi Comfort solutions to create better and great living places everywhere. Congratulations to all of them!“ said Pierre-André de Chalendar, Chairman and CEO of Saint-Gobain. 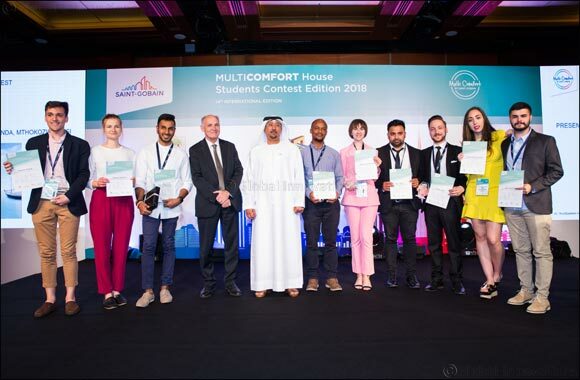 'The MultiComfort House Student Contest sheds light on the incredible efforts of a young generation of distinguished architects who will be key contributors to ensuring that Dubai will enjoy a sustainable environment in line with our leadership’s vision'.